Crews responded to the fire at 81 Juniper Dr. just after 12:30 p.m. where flames were shooting from the roof. "I was here within 2-3 minutes because I was around the corner. The entire attic was fully involved," said Saugus Fire Chief Michael Newbury. Fire officials said the blaze quickly reached 3-alarms and destroyed the home within minutes. 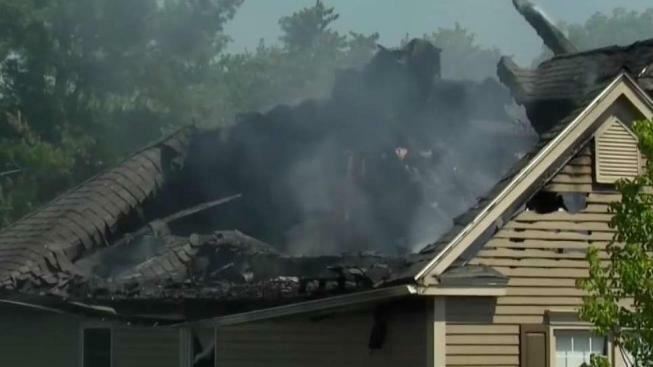 Firefighters battle a 3-alarm blaze at a residence in Saugus, Massachusetts. Relatives said the owners, two pastors, were away in Brazil on a church mission with their son when the fire broke out. No one had been inside the home for about a week. For Ouriel DeJesus, watching his sister's house go up in flames was difficult to watch. "The most important thing my mom just said is that no one was inside and everyone is OK," DeJesus said. Authorities said the fire appears to have started in the back of the house where a propane grill was located. It's unclear, however, if the propane grill is the exact cause.